This avocado dip recipe is just a little different than guacamole. If you are an avocado love like I am, you are going to love it. I love guacamole, but it’s nice to find different ways of enjoying this very healthy food. Peel the avocado and dice into a blender container. Add the green onion and lemon juice and blend until smooth. Add the remaining ingredients and mix well. Chill before serving to allow the flavors to meld perfectly. Makes 2 – 2 1/2 cups. Serve with vegetable chunks, potato chips or corn chips for dipping. This recipe is chock full of healthy goodness. Some people avoid eating avocados often because avocados have fat. But the fat in avocados is extremely healthy. The fat in avocados contain phytosterols, which helps keep inflammation under control. That makes avocados a great food for those with arthritis. Also, over half of the total fat in avocado is in the form of oleic acid, which is the fat also found in olive oil. Oleic acid helps increase our absorption of nutrients like carotenoids. Oleic acid has also been shown to help lower our risk of heart disease. So reach for those beautiful little green gems and eat more healthy avocados. Use low fat mayonnaise if you want to cut the fat content. I personally don’t like the idea of low fat versions of foods, but many people do. If you need this recipe to be totally gluten free please make sure your soy sauce and mayonnaise are both gluten free. Some are, but some are not, especially the soy sauce. To find more avocado recipes on the site simply put the word avocados or avocado (or any other ingredient you are interested in) into the search box that is at the top of every page on the site. You will be taken to a list of recipes containing that ingredient. 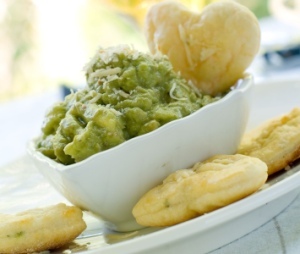 Look here for our guacamole recipe, a traditional avocado dip. Browse all of our dip recipes here. If you like this avacado dip recipe, I’d love you to Pin it to Pinterest, Tweet about it, Like it on Facebook and leave a comment below.